A week or so ago, we came across this quote from the great Polish-British novelist Joseph Conrad. You may have seen it posted on our LinkedIn page. At the time, we were putting together some thoughts for this blogpost on reputation management that stemmed, in part, from our reaction to the recent Starbucks incident. As communicators, we took note. Particularly, what was said and by whom after the whole thing went down. And we’ve continued to follow the conversations, both good and bad. When we saw this quote, we felt like it all tied together quite nicely. We’ll explain more on that in a minute. But first, surely by now everyone’s seen or at least heard about the incident involving two black men being arrested at a Starbucks in Philadelphia on April 12. Here’s the raw video if you haven’t yet seen it. Long story short, a store manager called police just minutes after these two men came into the store and sat down without making a purchase. According to news reports, the two men were waiting for a friend to join them for a meeting and one of them asked for the bathroom code. A few minutes later, police showed up and handcuffed the men, claiming they were trespassing. Seems crazy, right? How many times have we all walked into a Starbucks and done the same thing? Sat down and waited for a colleague to join us before placing an order. Heck, we did it just last week. Except we weren’t accused of trespassing. This often shows up in corporate responsibility efforts. Corporate X is focusing on its environmental stewardship. Organization Y is increasing its community outreach efforts. And business Z is looking into more ethical sourcing of materials. This is certainly one way to develop your reputation, particularly if you’re doing a bang-up job at one or more of these. However, we’re also seeing a shift in how companies are responding to internal and external pressures that pose a serious threat to their reputation. Let’s go back to Starbucks for a minute. Twenty years ago, this incident may have gotten a mention in the fine print of a Philly newspaper. Maybe not, given that the company decided not to press charges. One of the men or their family members may have filed a complaint with Starbucks. And those in the store at the time may have told a few of their friends what happened. Starbucks might have reprimanded the store manager, possibly even requiring her to go through additional customer service training. Who knows for sure how they would have reacted. What we can say with relative certainty is that the reaction would have been a far cry from what’s resulted from this latest incident. Why? The current social climate and social media. The Starbucks situation gives us a good example of how organizations are adapting their responses to a crisis. Instead of simply firing the store manager or putting her through mandatory training and calling it a day, Starbucks CEO Kevin Johnson immediately issued a written public apology. He followed up a day later with a videotaped apology in which he promised to address the issue. He then released another videotaped message where he said that what happened was wrong. In that video he also announced that the company would close its more than 8,000 U.S. stores on May 29 to conduct diversity training with all 175,000 employees. Starbucks further revealed that it hired a team of experts to develop the curriculum for the training, focusing on racial bias. Johnson even denounced the incident during live interviews with the national media. Here’s a look at a tear-filled Johnson talking about the incident with CNN’s Don Lemon. He did all of this in less than five days. And his communications team shared it as it was happening via the company’s social media networks. Just as we were publishing this story, CNN and other media outlets reported that the two men had reached agreements with Starbucks and the city of Philadelphia. While the details of the settlement with Starbucks are confidential, the two men said they settled with the city for a symbolic $1 and a promise from city officials to set aside $200,000 to support young entrepreneurs. Is the coffee giant’s response enough? As you can imagine, the backlash has been tremendous. The comments on the company’s Facebook page alone are hard to swallow. But, there’s something to be said not only about the dialogue this incident has created, but also the steps the company is taking to try and make sure it doesn’t happen again. Now, there are some critics out there that don’t believe Starbucks is doing enough, or even the right things. We’ve certainly seen our fair share of articles expressing different viewpoints. If you’re interested in seeing what others have to say, you can check out a few articles we found from Forbes, Al Jazeera and ABC News. But we’re not here to judge whether this specific approach will be successful. We’ll let you form your own opinion. Because, quite honestly, only time will tell if how Starbucks responded was appropriate. Instead, we want to give you some best practices that organizations are using today to help manage their reputation. And because the digital space seems fraught with pitfalls, we’re going to focus on tips to help you manage your online reputation. Buffett is right. One bad incident can cause irreparable damage to your organization. And if you think it’s tough to avoid the negative press in the first place, then you won’t want to hear how much time and money you’ll need to try and fix it later. Just consider how much sales Starbucks is losing from shutting down for a half-day in May. We cannot stress enough: Do not treat your reputation management as an afterthought. Here are six steps you can take to help keep your organization’s online reputation on the up and up. If you haven’t jumped on the Facebook, Twitter, Instagram, LinkedIn train by now, what are you waiting for? Whether we like it or not, social media is here to stay. And its power grows by the nanosecond. So, make sure your organization has an account on relevant social media networks. Notice we didn’t say all social media networks. Start small and focus on those networks that have the biggest impact on your business. Look specifically for those that will give you visibility and access to your core customers. In addition, we encourage you to monitor these platforms even if you don’t manage an account on them. There are tools out there that can help you do this. There’s no doubt this takes time, money and talent. But we can tell you from experience that it’s worth it in the long-run. From the beginning, set some ground rules, both with internal and external folks. You can start internally with some training on the do’s and don’ts of social media. You’ll also want to establish expectations around who can access the accounts and generate comments on the organization’s behalf. Not everyone should be able to log into your social media accounts. In fact, it’s a good idea to have a process in place for not only the development of new content, but also how it gets approved and posted. After you have your internal ducks in a row, you should set social media boundaries with your external audiences. This is often accomplished by posting guidelines on your networks. For example, if you do not condone any profanity, state this and indicate posts with any form of profanity will be removed. In addition, make sure people know when they can expect a response to a question or comment they pose. Is it within an hour? Or 24 hours? Or should they expect to wait up to three business days? Whatever response time you set, make sure your communications team sticks to it. And if you’re not prepared to support a certain function within a social media platform, then don’t activate it. For example, many platforms allow you to turn on comments. But this means your team needs to be prepared to respond to those comments in a timely manner. If they can’t, then let it be. Finally, make sure employees who are responsible for posting content understand the ins and outs of the platform. There’s nothing worse than accidentally posting content somewhere you didn’t intend to, only to find out later that you can’t edit or delete it. Employees who have access should also be aware of which account they’re on, particularly when using mobile devices. We’ve seen situations where an employee thought they were posting to a personal Facebook page when they were really posting to a company page. Oops! Bottom line: Don’t neglect your social media accounts! At a minimum, these increase awareness for your business. So, feed and water them and watch them grow. Organizations often feature their key executives and board members on their website. Some choose to write individual bios, while others prefer to connect users to professional sites such as LinkedIn. Some will argue that dedicated (written) bios for your key executives can help you rank higher in search. Regardless of which method you choose, make sure their profiles are updated and use clean, professional language. And be sure to connect to social media sites that are equally as professional. It might be funny to Mr. Cole’s family that he was enjoying his cocktail a little too much in his Hawaiian-themed Speedo, but your customers might not find it as humorous. This is especially true if your organization suddenly finds itself in a crisis. In addition to having strong executive profiles, we also encourage you to produce regular content that positions your executives as industry thought leaders. No one likes getting negative feedback, including companies. Online commentary is there for everyone to see, forever. But contrary to popular belief, negative comments aren’t the end of the world. And there are lots of ways to deal with negative feedback that don’t end with you simply deleting it. This, by the way, is a bad, bad thing to do. So, please take our advice and never, ever do this. Readers pick up on it pretty quick. Negative feedback gives your organization the opportunity to not only do service recovery with the reviewer, but it also allows others to see how you handled it. When you respond thoughtfully—and timely—it shows your customers that you care. This can go a long way in minimizing negative sentiments. In fact, a 2011 report found that responding to people can change their perspective. In the study, of those contacted after posting a negative review, 34 percent deleted their original post and 33 percent ended up posting a positive review instead. So, if you learn anything from this, it’s that you shouldn’t let negative comments go un-responded to. Want a real example? Check out the JetBlue response in this article on delivering good customer service via social media! The occasional blip in your reviews isn’t something to worry about. You’re never going to please all the people all the time. As we’ve said, the first step is to respond positively and transparently. Still, that negative comment will never go away online. So, we encourage you to minimize it by continuing to produce relevant positive content that, over time, will be more likely to show up on the first page of search results. Because we all know that page 2 is like death, right? At the end of the day, though, it’s still easier to avoid the negative altogether than to try and scrub it from the ubiquitous internet. 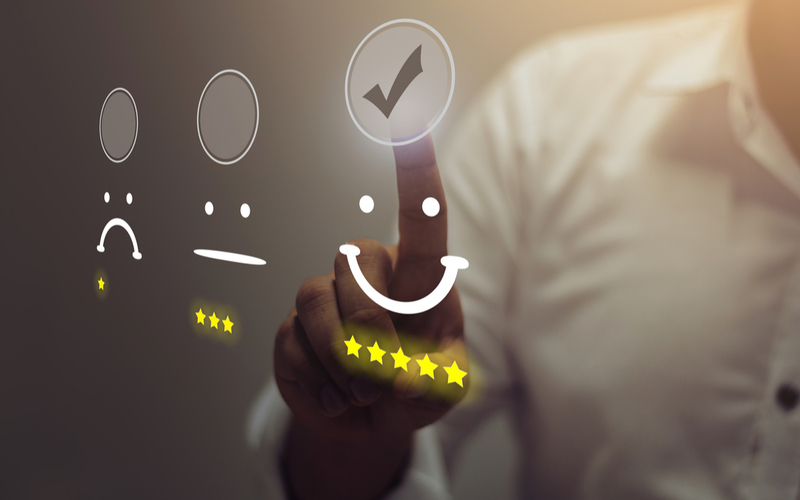 A third way to generate more positive press for your organization is to ask your most delighted customers to post a positive review. Some may feel this is a bit self-serving, but you’d be surprised to see how many customers are happy to do this—if you ask. Some companies do this through automated messages that customers receive within a day or two of making a purchase. The key is to make it easy for people. Listen and really hear what others are saying about you, particularly if they’re complaining about the same problem over and over. This goes for your own social media networks, as well as review sites like Yelp, Glassdoor and Foursquare. This is one of the benefits of maintaining a social media presence. It allows you to easily collect lots of feedback, consistently over time. And eventually, you’ll start to see some themes emerge. This can give you important intel into issues that need to be addressed before they spiral and become a bigger problem. Oftentimes, organizations will use this information to inform their onboarding and ongoing training efforts. Regardless of the level of customer service you think your organization provides, you will sometimes fail to meet a customer’s expectations. And none of us can fully manage someone’s feelings in that moment. Sometimes, the only thing to do is to say you’re sorry and offer to do whatever it takes to make it right. What that is depends on the person. What we view as “making something right” might not match another person’s expectations. So, you might need to ask. Hopefully you work for an organization that empowers you to make decisions in situations like these. These experiences can be a humbling. But it can also go a long way in diffusing a difficult situation. So, don’t be afraid to swallow your pride and apologize. Finally, remember that Rome wasn’t built in a day. And neither is your reputation. Building and maintaining your reputation is an ongoing effort that requires careful planning and execution. While some companies have the resources and talent to manage it themselves, others do not. And even when in-house resources can cover most of the bases, there’s value in hiring an outside consultant like IronStrike to provide perspective. Either way, don’t be afraid to bring in reinforcements when necessary. As a bonus, before we wind down this article, we’d like to leave you with a few key indicators that your online reputation is relatively solid. Accurate search results ensure that people can find you and your products/services. Accurate information ensures that people receive appropriate information that’s not misleading or just plain wrong about your organization. Active online participation indicates that you’re committed to your online community and helps position you an industry thought leader. Positive reviews indicate that people like what they’re seeing and experiencing about your organization. Being proactive in your reputation management can make or break your organization. Referring to where we started this article, the manner in which you respond to a controversy facing your organization matters just as much as any achievement or accolade. So, don’t forget to mind your manners and strive to do what’s right, every day with every customer. If you’d like an outsider’s perspective on the topic, send us a note.